Conventional flow cytometers on the market today may be able to resolve 200nm diameter polystyrene beads by light scatter but they will fall close to the instrument's sensitivity limit and polystyrene is far more refractive (refractive index approximately 1.59) than biological particles (refractive index typically 1.40). For example, a 400nm biological particle may scatter about the same as a 200nm polystyrene bead. Conventional flow cytometers are therefore not suitable for measuring light scattered by biological particles less than about 400nm diameter. The new Micro-PLUS is capable of measuring particles which scatter 1000 times less than 200nm polystyrene beads. The amount of scattered light falls rapidly with particle size so this exceptional performance is required for extreme small particle applications and opens up new areas of research (flow nanometry, flow virometry). The ApogeeMix beads (Cat# 1493) are intended for instrument performance assessment. The beads range in size from 110nm to 1300nm and include silica beads with a refractive index similar to biological particles. 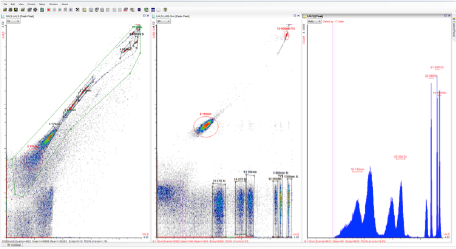 The Micro Flow Cytometer is in a class of its own for sub-micron biological particles, and leading the field in extracellular vesicle research. 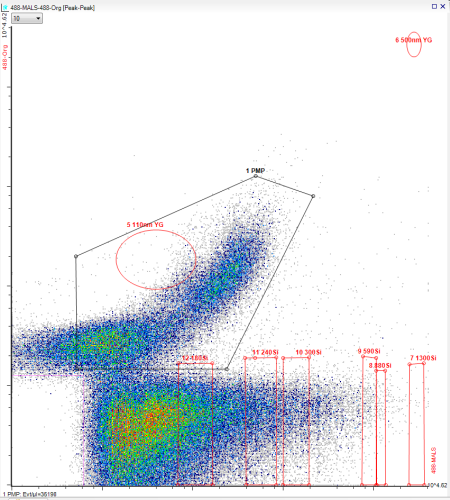 CD61-PE (vertical axis) labelled platelet derived extracellular vesicles shown on a datagram (light scatter on X axis) with regions of interest left over from analysing test beads (both non-fluorescent silica and fluorescent polystyrene). Note that all the CD61 positive vesicles scatter less than 300nm silica bead region (“10 300Si”) and that 300nm silica beads scatter less than the sensitivity limit of conventional flow cytometers. The Micro-PLUS model can measure biological particles down to about 100nm diameter by light scatter. This opens up new applications in virology where both light scatter and fluorescence can be measured from the virions. 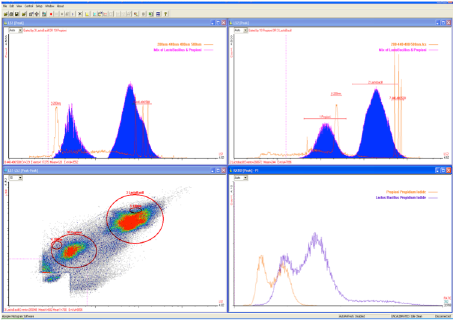 Use of flow cytometry for characterization of human cytomegalovirus vaccine particles.